(Oregon Coast) – A list of Oregon coast lighthouses and some supplemental information. Search here for latest news on these lighthouses or further information. (From the upper half of the coastline only - more do exist south). See the virtual tour links provided for deeper details on the lighthouses. 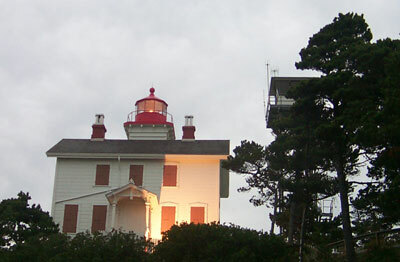 Heceta Head Lighthouse, near Florence (above). It stands 56 feet high on a 200-foot-high cliff, and is considered among the world's most photographed lighthouses. Construction on the Heceta Head Lighthouse started in 1892, firing up about two years later. It's visible some 21 miles out to sea. The first-order Fresnel lens was made by Chance Brothers of the Birmingham area, who only manufactured two other lights in the U.S. That original lens still remains, with eight prisms and a total of 392 pieces that are two inches thick. 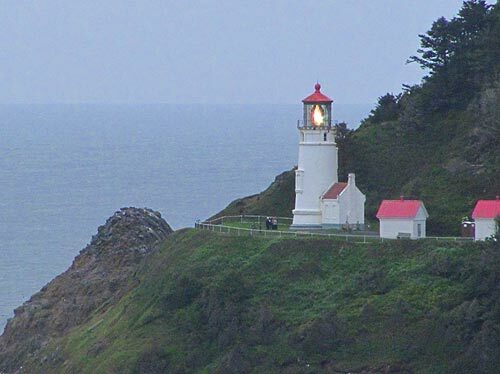 A total of 12 lighthouse lenses were made in England and brought here, but apparently the Heceta Head Lightouse is the only one of them left that is first-order. You can visit year round, but it is dependent on weather and staffing. Yaquina Head Lighthouse, Newport. On the tip of three-mile-long Yaquina Head sits the big one, standing at 93 feet tall. It is Oregon's oldest and tallest, first fired up in 1873, sometime after the name of the headland was finally switched from Cape Foulweather to Yaquina Head (and the cape ten miles up the road received that name). The keeper's quarters here were built in 1873 but demolished in 1984. There are 114 steps up to the very top, which guides let you briefly peek into. Yaquina Bay Lighthouse in Newport. The second light in town is actually now simply a big home open to the public. It only existed as a lighthouse in the 1880's for three years, then shut down when the larger light to the north was built on the headland. After its shut down, and sat abandoned, sinking into greater and greater disrepair until some locals began rescuing it in the mid 20th century. Now, you can tour the quarters and see how people lived (and dressed) back then as volunteers give you tours of the stately residence. (541) 265-3100. 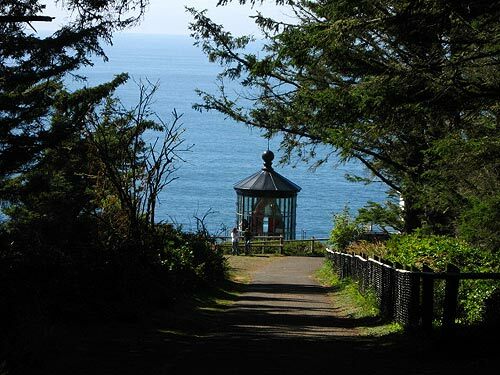 Cape Meares Lighthouse. Just around the corner from Oceanside, it's the shortest on the Oregon coast, standing at a stumpy 38 feet high. 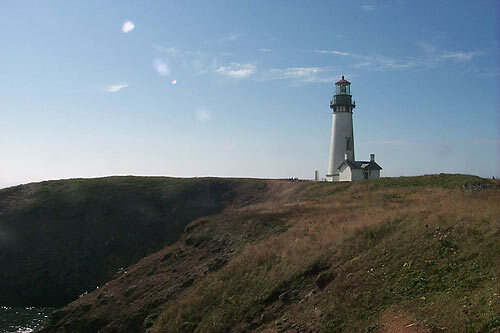 The cliff is a few hundred feet high, however, making it the highest standing Oregon lighthouse in the end. Back in 1890, it was constructed of bricks that were made right on the spot, along with iron plates that had to be hauled by wagon from Portland over the bumpy terrain of the coast range. The first order Fresnel lens was imported from Paris, France, shipped around Cape Horn, up the west coast to Cape Meares and then brought up 217 feet from a boat below the cliff by a wooden crane. It's open to the public April through October. Tillamook Rock Lighthouse, between Cannon Beach and Seaside. 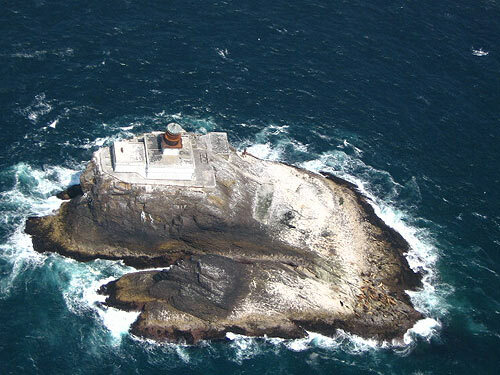 It's the only lighthouse in Oregon completely not accessible because it sits about a mile offshore. It's been nicknamed “Terrible Tilly” because of the adverse conditions crews had to endure on this remote rock. The lighthouse went into service in 1881, manned by four people at a time, stuck there for months. A giant winch was used to bring supplies and personnel from visiting ships to the rock, which was a dangerous and unwieldy endeavor under even the best conditions. Living on the rock meant being regularly attacked by enormous storms. Having boulders and logs tossed through glass was not an irregular occurrence. One tale has a giant bird slamming into the glass around the holidays - when the men aboard were running low on supplies. So, they turned the ill-fated winged beast into a holiday feast. The lighthouse was decommissioned in 1957.